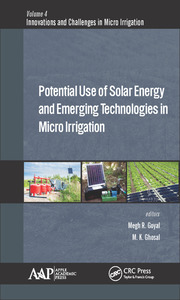 The editors present valuable research and information on micro irrigation methods in an effort to focus on innovation and evolving new paradigms for efficient utilization of water resources. 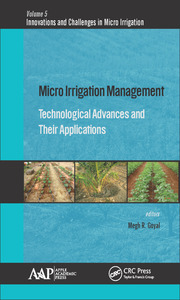 The adoption of micro irrigation systems can be a panacea for irrigation related problems and can help to increase the yield and area under cultivation, especially for small farmers without abundant technological resources. 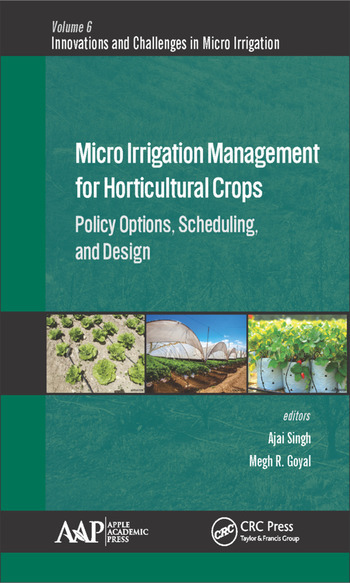 Micro Irrigation Engineering for Horticultural Crops: Policy Options, Scheduling, and Design will be valuable for agricultural engineering students, irrigation engineers, and scientists/professors in engineering. Ajai Singh, PhD, FIE, is an Associate Professor and Head of the Centre for Water Engineering and Management at the Central University of Jharkhand in Ranchi, India. He is a Fellow of the Institution of Engineers (India) and a life member of the Indian Society of Agricultural Engineers, the Indian Water Resources Society, the Indian Association of Hydrologist, the Indian Meteorological Society, and the Crop and Weed Science Society. Formerly he has worked as junior project officer at the Indian Institute of Technology (IIT) Kharagpur; and then as Assistant Professor at North Bengal Agricultural University, West Bengal. He has authored more than 30 articles in technical journals and textbooks, including the book Introduction to Drip Irrigation. 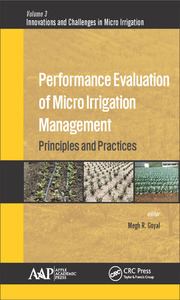 He has also written the books Hydrological Modelling Using Process Based and Data Driven Models and Finite Element Analysis and Optimal Design of Drip Irrigation Sub-main. His area of active research is hydrological modeling, micro irrigation engineering, water resources planning and management, and groundwater hydrology. He has been conferred the Distinguished Services Certificate (2012) by Indian Society of Agricultural Engineers, New Delhi. Dr. Singh received a BTech degree in Agricultural Engineering in 1995 and completed his MTech. in 1997. He obtained his PhD degree in 2011. Megh R. Goyal, PhD, PE, is a Retired Professor in Agricultural and Biomedical Engineering from the General Engineering Department in the College of Engineering at University of Puerto Rico–Mayaguez Campus; and Senior Acquisitions Editor and Senior Technical Editor-in-Chief in Agriculture and Biomedical Engineering for Apple Academic Press Inc. He has worked as a Soil Conservation Inspector and as a Research Assistant at Haryana Agricultural University and Ohio State University. He was the first agricultural engineer to receive the professional license in Agricultural Engineering in 1986 from the College of Engineers and Surveyors of Puerto Rico. On September 16, 2005, he was proclaimed as "Father of Irrigation Engineering in Puerto Rico for the twentieth century" by the ASABE, Puerto Rico Section, for his pioneering work on micro irrigation, evapotranspiration, agroclimatology, and soil and water engineering. During his professional career of 45 years, he has received many prestigious awards. A prolific author and editor, he has written more than 200 journal articles and textbooks and has edited over 25 books. He received his BSc degree in engineering from Punjab Agricultural University, Ludhiana, India; his MSc and PhD degrees from Ohio State University, Columbus; and his Master of Divinity degree from Puerto Rico Evangelical Seminary, Hato Rey, Puerto Rico, USA.